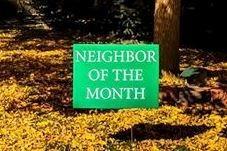 From September 2016 to October 2017, residents were nominated for good deeds in our "TrailMark Neighbor of the Month" from posts made by other TrailMark residents on the TrailMark HOA Facebook page. Winners were chosen by the amount of likes to the post, so it was the community members that got to vote. Up to four winners were selected every month, and each person/family was given a $25 gift card as a thank you for their contribution to our neighborhood. Congratulations, Neighbor of the Month Winners! Chris and Carrie Classen for their original Halloween display. Kelly Kidd Swickard and family for their fun Halloween display. Juli Hill and Gabrielle Handley for going above and beyond as bulletin board managers. Andrea and Eric Shearer​ for helping with the 4th of July parade and helping neighbors in general. Andrea also volunteers at her kid's schools and with pet fostering. Andy Farish​ for being “such a nice person and great neighbor,” including trimming the grass for all of his neighbors. Abigail Russum​ for helping to keep our beautiful neighborhood and open space free of trash. Gabrielle and Rick Handley for helping out in TrailMark throughout the year. Stacey Provo-Solheim for contributing to the Falcon Bluffs PTO and planning great neighborhood block parties. Britt Snyder for helping a resident with home projects. Sandy Farish, Sally Janssen and Kim Longbrake for giving numerous hours freely to the TrailMark community as part of the HOA board and subcommittees. Emma Wildermuth for her involvement in our local schools and the Jefferson County school district. Joe Chuita for helping a neighbor/cancer patient by unexpectedly shoveling his driveway during a rough time. Patty Pabst for helping a neighbor/cancer patient by unexpectedly shoveling his driveway during a rough time. Lindsey and Richard Binkley for hosting such awesome block parties in our neighborhood on Holland Street. Michael and Debbie Elbeck for hosting such awesome block parties in our neighborhood on Holland Street and for discovering and sharing about the community grant Littleton gives out. Bernie Gehan for breaking up hundreds of lbs. of ice from the sidewalk and mailboxes. He is responsible for the beautiful Christmas lights on the Star Canyon sign and he has a wonderful train layout! Zoe Grant for leading our elementary school as the PTA president at Shaffer Elementary. She puts in countless, hands-on hours to serve the children in our community. ​Alex Alameddin for selflessly giving up the better part of two weekends to help numerous neighbors winterize their sprinkler systems. This is an annual neighborly service he has done for many years. Julie Bentley Devin for helping with the Communications Committee, writing the monthly email news updates, and introducing NextDoor.com to the neighborhood. Joy and Phil Kinney for going above and beyond for a fellow neighbor who was sick. They came over with food and flowers, and came back to check in on her and do errands. Janet Weyhmiller for helping a neighbor in need. When a local child accidentally came home on the bus when the parent weren't home, Janet stepped in to take him home, fed him and kept him safe until the parent could get there. ​Tim Dougherty for being a helpful, friendly neighbor, running the marathon every year for the loss at Sandy Hook, and plowing many neighbors driveways, even the street. Linda Fields for keeping us up to date on current meetings and questions that come up from new neighbors. Linda Jagiello for being webmaster of the TrailMark.org website. Deahna Brady Visscher for all the hours she has spent getting us a great rate for State Park Passes. ​Robert Cannady for his positive social media posts and for his stunning and inspirational photography of the neighborhood. Juli Warton Hill for planning so many incredible events over the years for the enjoyment of all. Rick Redman for being helpful to his neighbors! He has cleared snow on other's driveways and sidewalks many times over the years, cut down dead trees and repaired sprinklers. Some files on this site are in PDF format and require Adobe Reader Software to view. Download Adobe Reader to view the documents. Content copyright 2019. TrailMark at Chatfield HOA. All rights reserved.